Here is a small geometric pattern in a honeycomb sort of style. I hung this in the bathroom of a school-aged boy in a 1940 home in River Oaks – where just about every single other thing was white. Navy blue can be considered a neutral color, so it adds color and personality, without overwhelming the home’s calm theme, like red or green or yellow would. The interior designer for this job is Elizabeth Mann, and the wallpaper is a paper-backed vinyl (scrubble, which is great for a home with young kids! ), by Thibaut Designs. 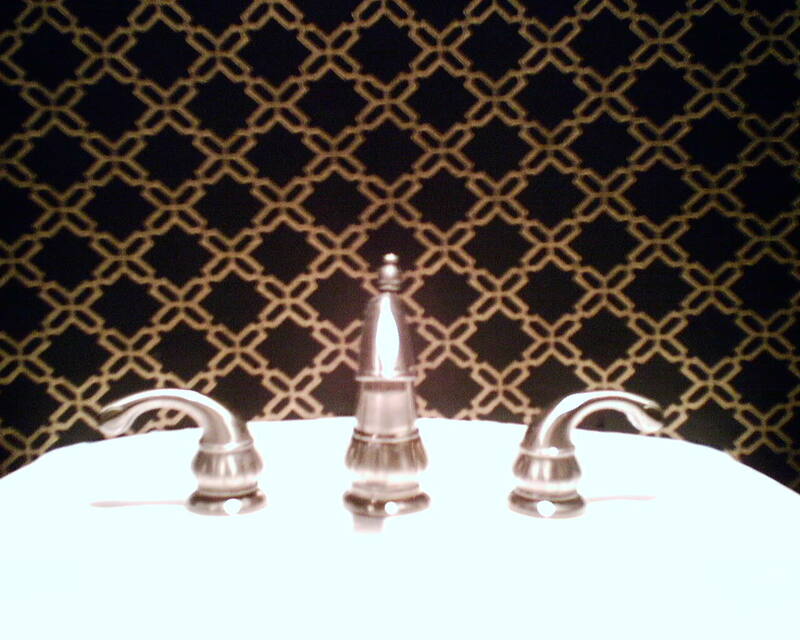 How does gold-on-black strike you for a little drama in a powder room? I say – WOW! This under-the-stairs powder room in EADO had been through three changes of paint colors, but still was uninspiring. The homeowner is a gal with a vibrant personality, so something more dramatic was calling her. She LOVED it! A large, carved, gold mirror will be added, pumping up the volume even more. There were some real challenges to this job, however. 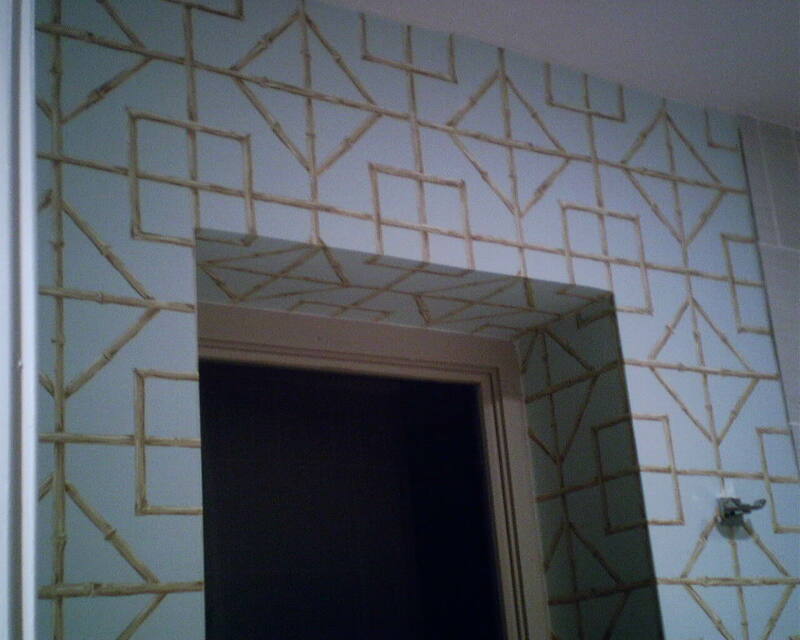 With a regular geometric pattern like this, your eye wants to see the same element at the top of the wall all the way around the room, and ditto for the vertical butts next to the door molding. In addition, the pattern should match perfectly (or as nearly as possible) in the corners. But the walls in this room were wildly off-plumb, and the ceiling was not even trying to be level. 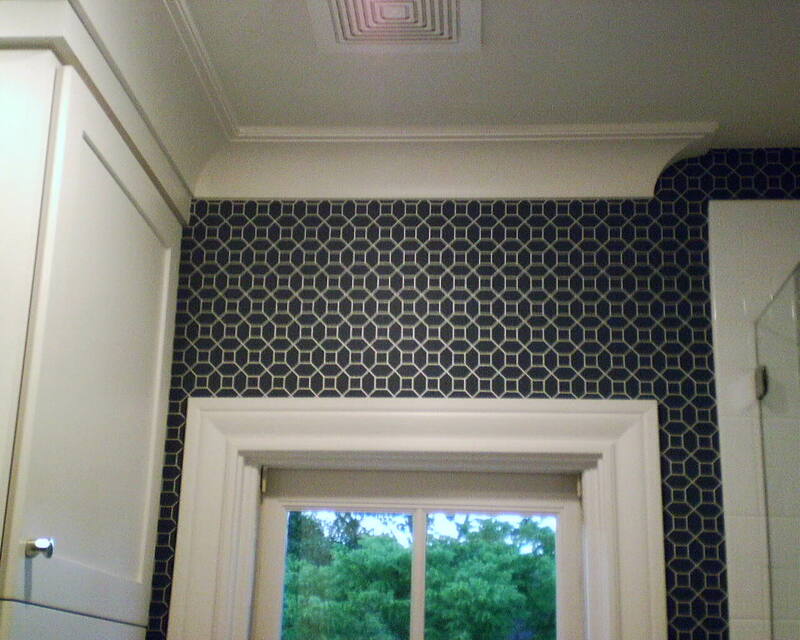 This meant that at the ceiling, the pattern would look like it was marching up or down hill, and in the corners there would be noticeable mismatches from floor to ceiling. I advised the homeowner about this, and she understood the constraints of the room and gave her OK. But I knew that those mismatches would look pretty obvious and pretty terrible. So I thought about it a while and came up with a way to make everything look pretty darned good. Even though it’s a constant geometric pattern, it’s small and busy, so I knew the eye wouldn’t notice if it went a little off-kilter at the ceiling. Besides, since the room was under the stairs, much of the ceiling was sloped, and there is no way you can keep the “X’s” marching straight across a sloped ceiling. But where the eye would notice something off-kilter would be in the corners. If the paper ran into an un-plumb corner, the pattern would become disfigured, with part of the motif larger at the top of the wall and then getting cut off narrower at the bottom of the wall. If I hung a plump strip next to that, it would mis-match horribly. So I thought, “Why not hang the next strip NOT plumb?” That way, I could tilt the paper and align it so the pattern on the new strip matched the previous strip perfectly. It would mean that the design would go crooked (downhill) along the ceiling line. But as mentioned above, the ceiling line was not really important in this room. This turned out to be the perfect solution. There were no glaring mis-matches, and no one noticed that the “X’s” along the ceiling or door frames are not absolutely level or plumb. 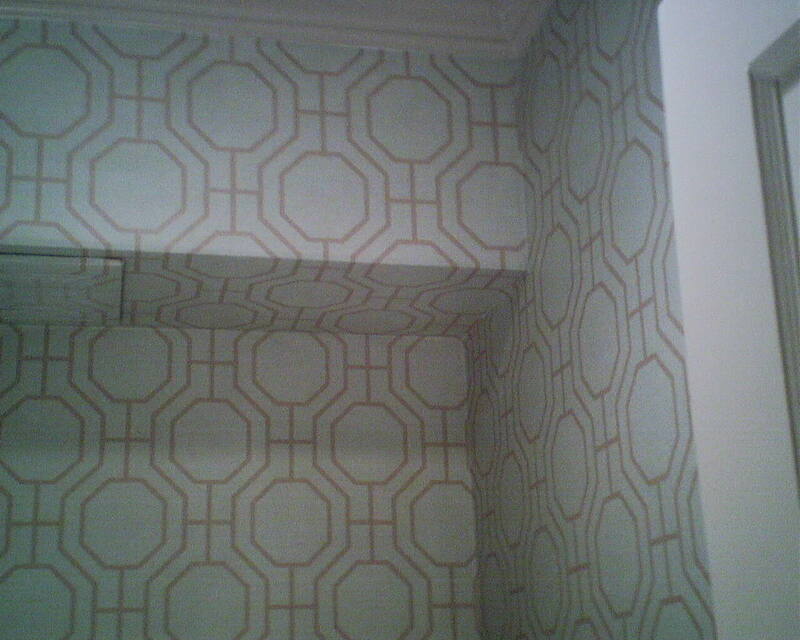 This wallpaper pattern is by York Wallcoverings, and was bought at a discounted price from Dorota Hartwig at Southwestern Paint on Bissonnet near Kirby. (713) 520-6262 or dorotasouthwestern@hotmail.com. Discuss your project and make an appointment before heading over to see her. Geometric patterns are all the rage right now. But they are taxing to work with, because walls are never plumb and patterns tend to move up and down the wall. When you have to wrap wallpaper around elements, the chances of things going awry are even greater. I am pleased with the way this one worked out. 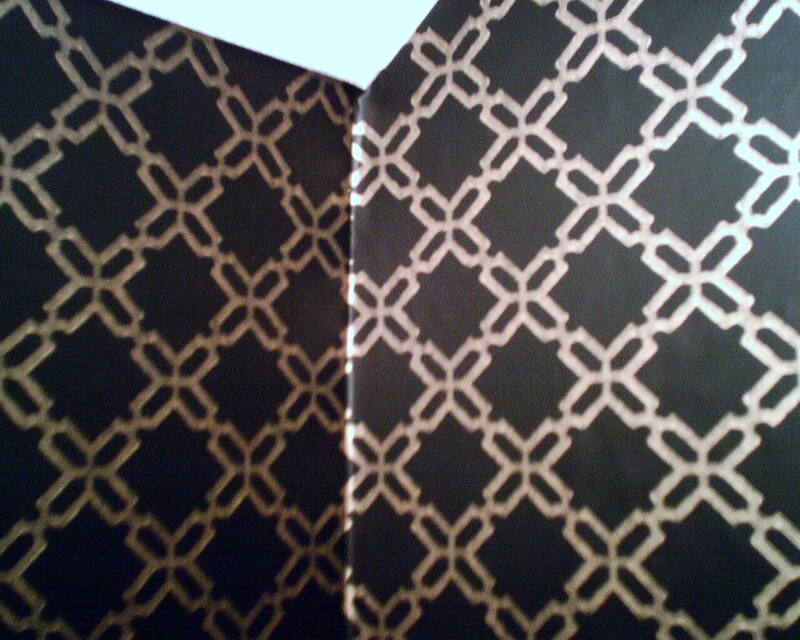 When papering a room in a geometric pattern like this, the eye wants to see the pattern move evenly around the room. Yet, with a fur down like in the photo, if you keep the pattern even around the top of the wall, it will mis-match under the fur down. And if you match it under the fur-down, it will mis-match at either corner at the top of the wall, as well as at the ceiling line. I decided (and the homeowner agreed) that it was more important to keep the pattern intact where it was most visible, which was the long horizontal line under the fur down. So I matched the paper on the underside of the fur down to the paper on the back wall. However, the fur down was not level or plumb, so when I tried to wrap the paper up the vertical side, it went cattywhompus. That meant that it would not march evenly along the ceiling line. So instead I used two pieces, one for under the fur down, and one for the vertical façade. I matched the “under” piece to the pattern on the back wall. Then I cut a separate piece for the façade, but straightened it so it hung true to plumb. I could get away with this because vertical lines are always plumb. You don’t notice that the bottom of the fur down is not level; all you see is that the vertical lines on the back wall, under the fur down, and on the upper façade, are all lined up and plumb. There were three strips in this run. The first two looked perfect. By the third strip, the unlevel fur down took a larger change in direction, so it was impossible to disguise the mis-match entirely. But the mis-match (not shown) was minimal, in the overall scheme of the room. Usually, when you wrap a fur down from the bottom up, the pattern becomes distorted at the ceiling. But another happy outcome of this job is that the pattern landed at the ceiling line pretty much at the same distance as the walls without the fur down. So, even though it mis-matches at the left and right corners (unavoidable), the overall effect looks quite homogenous. 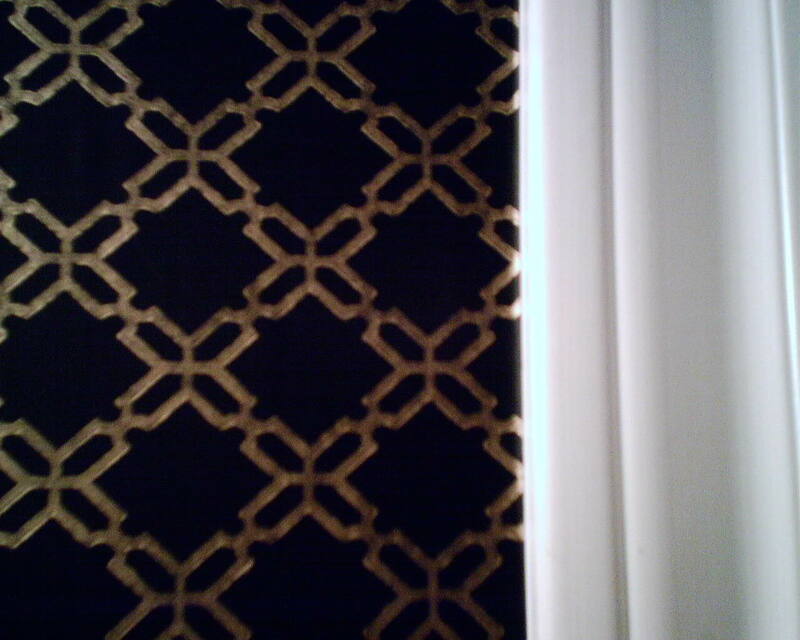 Here is a classic trellis pattern in a master bathroom, nicely centered on this window. We were very tight on wallpaper. The homeowner is an interior designer, and he ordered his paper before having me come and measure. I calculated for 14 single rolls; he ordered only 12 rolls. There was no way to get more paper, so I futzed and figured and spliced and played, and made it work. I papered this window wall and the adjoining door wall. 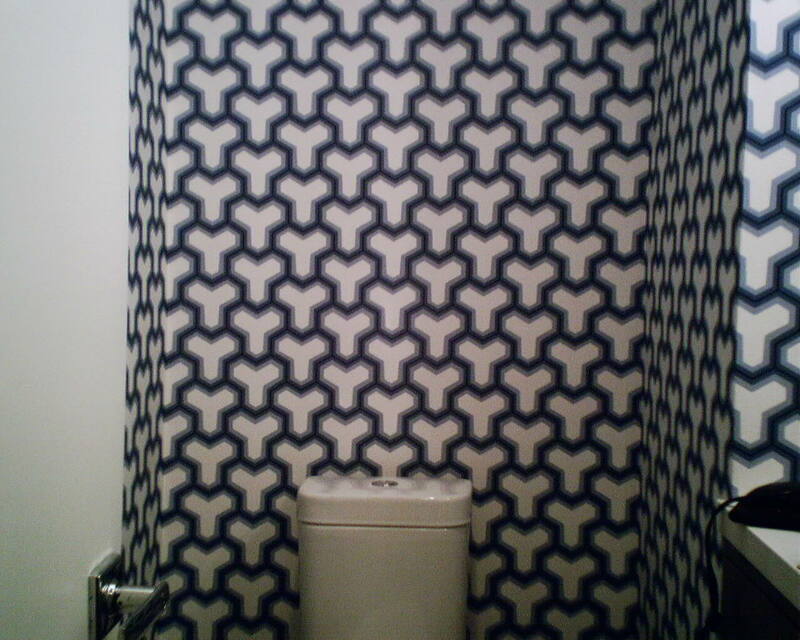 The homeowner really wanted the wallpaper around his bathtub, too. There was enough paper to do the side walls, but not the back wall. 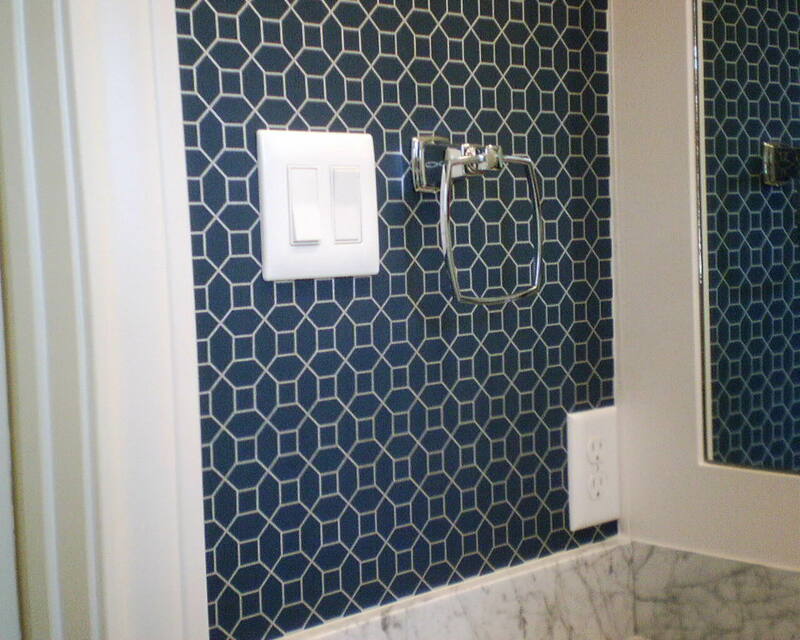 But he really wanted that wall done, so we agreed that I could mis-match some other areas, in order to have enough wallpaper to cover that back wall of the tub alcove. That meant there wasn’t enough wallpaper to do the window wall the way I normally do. So I hung the top and sides of the window area, and left the “ceiling” of the window area unpapered, until I finished the rest of the room and could see how much wallpaper was left, and what the pattern match was. Long story short, there was not one scrap of paper large enough to fill the space, that was also the correct pattern match. So I fudged it. I found a piece that was similar to the pattern match, and trimmed it to abut the top front edge of the window alcove. It doesn’t match exactly, but it looks pretty darned good. I filled in the places that didn’t match with colored pencil and scraps of wallpaper. In addition, the window alcove was not square. (Nothing in this entire two-room bathroom was square or plumb. Believe it or not, the north wall was two inches shorter than the south wall. 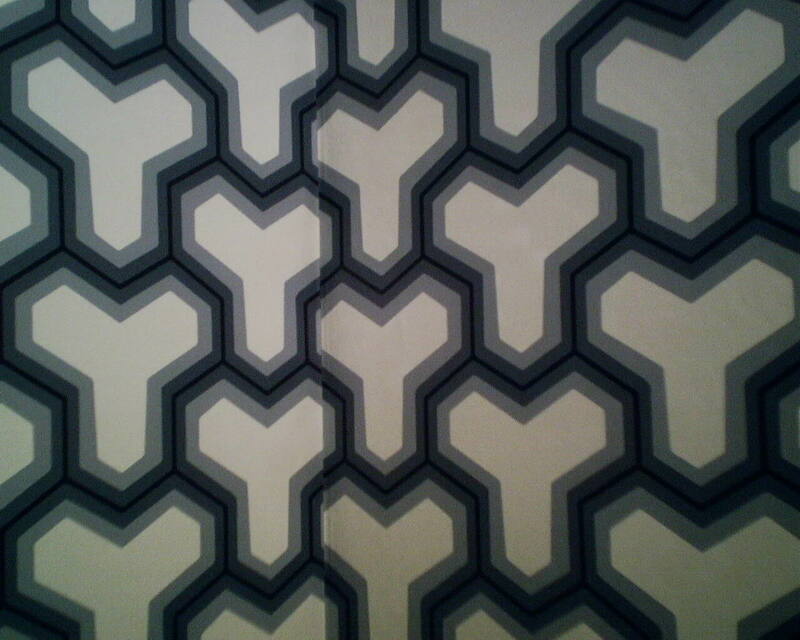 What a nightmare with a geometric pattern like this!) Anyway, part of the trellis ran exactly along the corner of one side of the window ceiling. But it was crooked and off by 3/4″ on the opposite side. So I cut a piece of the trellis design from some left over paper, and pasted it in the off corner, artfully disguising the crookedness. When the homeowner came in, he looked at the window and said, “You told me it wasn’t going to match, but it does! It all looks perfect!” I had successfully fooled his eye, and he loved the finished room,,, and that’s what matters most! Here we are, turning a corner in a powder room in the Montrose neighborhood. The walls were out of plumb; off by more than half an inch from the top to the bottom – with a bulge in the center, to boot! In this kind of situation, with crooked walls and a very regimented wallpaper pattern, there is no way you can avoid or hide the resulting mismatch. Luckily, this only happened once in this room. The opposite corner was nicely plumb, and the piece on the next wall matched perfectly. It’s a busy enough pattern that one might not even notice the mis-matched design in this one corner.